Hovering between detail and abstraction, my mosaics excite the imagination with their unique and obsessive qualities. Most importantly however, the art embodies love and compassion and makes a connection with people very quickly, opening the door for empathy; the human yes. My process begins with a desire to aid in providing visibility to causes that support human and civil rights: issues that affect culture and society, locally and globally. Motivated by the need to transform my feelings of immobilization into a positive action, I began to construct a way to explore and express my internal architecture instead of superficially manipulating my external one. My premise is simple; before you can be heard you must be seen, and art is a powerful tool for achieving this goal and advancing understanding. Combining direct hand-processes with computer technology, I construct mosaics using origami peace cranes as my medium. After meeting with individuals and advocates of the issue or subject to be explored, a piece is forged, often with hands-on non-artist participation. Inviting people both young and old involved with the subject to learn origami, I find that many, especially children, are already aware of the symbolism of the crane and have already folded some, though not as part of a communal art effort. At the conclusion of this empowering journey, the resulting pieces of art not only convey messages, but also create a connectedness that speaks to what it means to be human and an essential part of a big picture. Initially possessing the feel of quilts upon first viewing, the mosaics encourage sensory memory triggers that elicit familiarity and comfort. This association helps to express ideas and issues in a non-polemical fashion to new or otherwise uninitiated audiences. 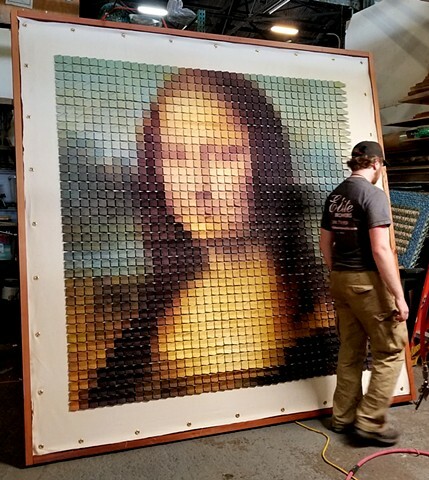 Physically, the mosaics require the viewer to literally gain some perspective in order to see the larger picture, as the images they depict are slightly out of focus when one is too close. This blurriness and perspective combined form a unique device for understanding the digestive process of memory and history. I first started my professional career as a graphic designer in childrens publishing. I migrated into furniture and have been designing and building art furniture for over 15 years. The events of September 11th again turned my career in a new direction. I wondered, if the world were really listening, then what would we want it to hear? I constructed a sculpture of the Twin Towers from scrap wood in my studio. This piece was so somber and funereal, that the sight of it made many people cry. While speaking with people for whom 9/11 recalled the bombing of Hiroshima, I remembered meeting a Buddhist nun who continuously folded Origami Cranes to send to the peace park there. I thought I could transform the sculpture by surrounding it with these symbols of peace, hope and healing. I invited others to join me in folding Origami cranes; from this process emerged the WTC Healing Project, which is an online education and collection site devoted to origami cranes. After a short period of time, I had amassed a large number of cranes. I began to further their use by assembling them into flags to represent the nations who lost citizens on 9/11. I soon began to expand the medium even further. Through a process of experimentation and evolution, I developed a technique that curiously weds origami and photography with the computer to create complex Origami Mosaics, employing thousands of cranes in any given piece. Often reflecting an archive of activism, these works meander through an organic path exploring themes as varied as the trials of modern Tibet, American cooking, civil and human rights, and the joys of childhood. A narrative collection of causes, people and issues embraced with love, expressed in peace. Yoko & Friends. World Trade Center Healing Project placed crane wreath at Strawberry Fields. Program and philosophy. Scott Squire journalist. four women and how each chose to respond to 9/11. Many Feet and One Message; Imagine 7,000 Cranes. By Tyche Hendricks. Art of Peace: 50,000 and CountingMessage of Paper Cranes Takes Flight. By Diana Walsh. Oakland Museum~ October thru November 2001: Special Exhibit in conjunction with the Day of the Dead event; including origami demonstrations and participation of visiting schools. Various installations NYC September 11-13, 2002; were joined by several national and international WTCHP participants in handing out 200,000 peace cranes as gifts of love, over a four-day period, at various locations in Manhattan. Global Security Institute S.F. April 2003: Arranged installations as invited artists, providing 4,000 cranes for the presentation of the Alan Cranston Peace Award to Nancy Pelosi. Asahi Art Festival, Tokyo July 2003: Group installation with Operation Peace Crane founder Shing02. Yerba Buena Gardens S.F. September 8-10 2003 : Stone Stage lunchtime installations for pre-event awareness and outreach. Justin Herman Plaza S.F. September 10 2003: LOVE EACH OTHER origami banner unveiled, folding workshops and paper lantern construction, for Bay Area United for Peace and Justice 9/11 vigil. Oakland City Hall September 10 2003; IMAGINE mosaic installed as centerpiece of the United Methodist Candle of Hope Vigil. 9/11 Remembrance Vigil+Art Show/Aurobora Press+Gallery S.F. September 2002: A day long 9/11 event including an exhibit of the entire WTCHP collection, ongoing folding workshops, paper lantern making, and a candlelight walk to the Martin Luther King Fountain at Yerba Buena Gardens. United Nations Plaza, Bali Remembrance S.F. October 2003: Installed an origami crane flag adjoining those of Bali and Australia with a black crane wreath, to commemorate the 2002 bombing in Bali. In conjunction with the ELD class from Serramonte Adult School who helped complete the construction of the flags, and visited by a representative of the Indonesian council in San Francisco. Moving Targets: the Art of Resistance SF Camerawork Group mixed media show exploring current visual themes in the Anti-War Movement. August 7th Day of Remembrance Organizer and exhibitor for Berkeleys third annual Lantern Ceremony remembrance for the victims of Nagasaki and Hiroshima.